The Romanovs were a Russian imperial dynasty, lasting from 1613 to 1917. It was founded by Michael, whose accession ended the Time of Troubles that had followed the death of Fyodor I (Theodor), the last of the Rurik dynasty. Michael's descendants, especially Peter I (The Great) and Catherine II (The Great), a Romanov by marriage, transformed Russia into the world's largest empire. The last Romanov emperor, Nicholas II, abdicated in 1917 and was later murdered by the Bolsheviks. The Romanov Dynasty consisted, in chronological order, of the following: Michael (from 1613-1645) was succeeded by his son Alexis Mikhailovich (1645-1676), then by Alexis' three sons, Theodor (1676-1682), Peter I (The Great) (1682-1725), and Ivan V, who, from 1682 to1696, shared the throne with Peter. Following the death of Peter the Great, the throne went to Peter's wife Catherine I (1725-1727), then to one of Peter the Great's grandsons, Peter II (1727-1730). He was followed by Ivan V's daughter Anne (1730-1740), then for a brief period by Ivan VI (1740-1741), the grandson of Ivan V. He was followed by Elizabeth (1741-1761), the daughter of Peter I. On Elizabeth's death in 1761, Peter III, another grandson of Peter I ascended to the throne for a brief period (1761-1762), at which time Catherine II (the Great) became Empress of Russia (1762-1796). Catherine was succeeded by her son Paul (1796-1801), then by Paul's three sons, Alexander I (1801-1825), Constantin (1825), and Nicholas I (1825-1855). Nicholas I was succeeded by his son Alexander II (1855-1881), then by his son, Alexander III (1881-1894), and finally by his son, Nicholas II (1894-1917), the last of the Romanov dynasty. Alexius (Alexis) Mikhailovich (1629-1676), Tsar of Muscovy (1645-1676) was the son of Tsar Michael Romanov. 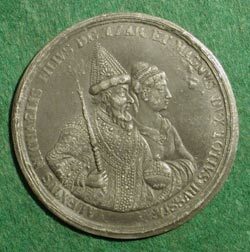 By his second wife, Natalia Kirilowna, shown on the medal, Alexius fathered Peter I (The Great). Alexius established a code of laws that sustained serfdom in Russia until the 19th century, at which time Tsar Alexander II emancipated the serfs (see Visit of Alexander II to the City of London in the section on Medals Struck by the Corporation of the City of London). 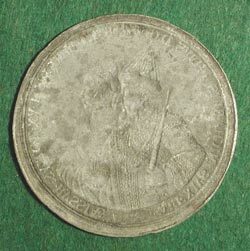 This is the obverse of the medal "Birth of Peter the Great 1672" and was likely engraved at the St. Petersburg mint by Samuel Judin during the reign of Catherine the Great. The medal is without a signature, and the design appears to be copied from a similar medal engraved by the German medallist Peter Paul Werner.